Poison Dart Frogs Might Make Good Medicine : Shots - Health News The toxin comes from tiny frogs in Colombia — the ones that pack a punch on the tip of poison darts. In the past, research on toxins like this has led to some pretty amazing drug discoveries. The skin of the golden poison dart frog, Phyllobates terribilis, secretes a deadly poison that might lead to a better understanding of how to treat malfunctions of the human nervous system. 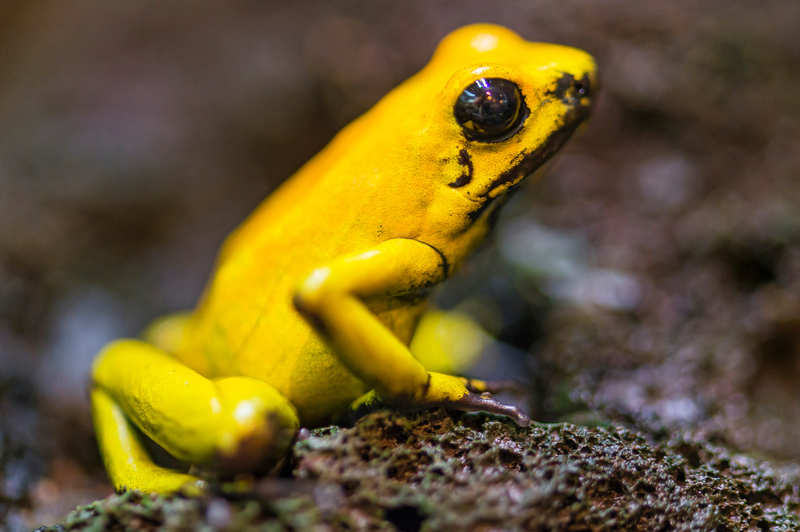 The golden poison dart frog is about an inch long and banana yellow. By some estimates, the skin of one little frog contains enough toxin to kill 10 adult men. "Oh yeah, it's one of the more lethal poisons on the planet," says Justin Du Bois, a synthetic chemist at Stanford University. The substance is called batrachotoxin (buh-TRAK-uh-TOX-in), and tiny amounts of it can be deadly if it makes it into a victim's bloodstream. It's what some indigenous groups in Colombia's lowland rain forest would use to tip their blow darts. And, as Du Bois and his colleagues write Thursday in the journal Science, they figured out how to make it in the lab in 24 steps. Why on Earth would anyone want to do that? "Well, it turns out it's a fantastic research tool for figuring out how nerves conduct electricity," Du Bois says, "and we're very interested in that fundamental process." Once inside a victim, the compound embeds itself in certain proteins that are responsible for conducting electrical impulses through the nerves and muscles, including the heart. By disrupting that process, it can cause paralysis and a heart attack. But studying the poison's mode of action could also lead to a deeper understanding of the role electrical impulses play in fundamental processes like heart function and the sensation of pain. "There are very few molecules like this that we're aware of," Du Bois says, "and we would like to really understand how it works." And maybe — just maybe — some version could be developed into a useful drug. Du Bois points out a few rare diseases that involve malfunction in the same proteins that this toxin acts on; one such disorder prevents a person from feeling any pain at all. "You could literally run a knife through their hand and they wouldn't feel a thing," Du Bois says. Some of the same proteins are involved in a condition that's sometimes called "Man on Fire syndrome," because people who have it experience frequent pain and burning. "Molecules like batrachotoxin are essentially a key into mechanisms of how our nervous system works," says Toto Olivera, a biochemist and neuroscientist with the Howard Hughes Medical Institute who is based at the University of Utah. The more specific the compound is, and the more potent, he says, then "sometimes, the greater the insight that you can gain." There's a long list of nasty toxins that, with a few tweaks in the lab, have proved useful for human health, Olivera points out. Take curare, for example. The poison from tropical plants is now used as a muscle relaxant during some kinds of surgeries. Olivera's lab found that the venom that certain sea snails — Conus magus — use to paralyze fish also acts on an important mechanism in the human body's communication of pain. That led to the development of a painkiller that is now used in patients who have become tolerant to morphine. "Sometimes, you can add one atom to a compound and totally change how it acts," says Becca Tarvin, a doctoral student in evolutionary biology at the University of Texas, Austin. She studies the toxins of poison dart frogs and just got back from a trip to Colombia. Tarvin says the various species of poison dart frogs contain at least 500 different toxins. She knows firsthand how some of these toxins feel once they're in your system; she and a field assistant once licked a few of the milder frogs, to see how they differed. "One just tasted like sushi, like raw fish," she says. "The other one had kind of a bitter flavor that stayed in your mouth. But the last one I tasted, it tasted bitter at first. And then I could tell on my tongue the area that had touched the frog and the feeling kept spreading until my mouth was kind of numb." Out of those 500 toxins, scientists know the biological activity of about 60. "So, being able to synthesize any of these compounds is super important in figuring out how they work and how they could be developed as drugs," Tarvin says. But another reason it's important to synthesize these compounds, the scientists say, is that they are getting harder and harder to find in nature. A lot of these frogs are endangered. "Because of that," Tarvin says, "our chances of finding these toxins and these frogs before they're gone is low."